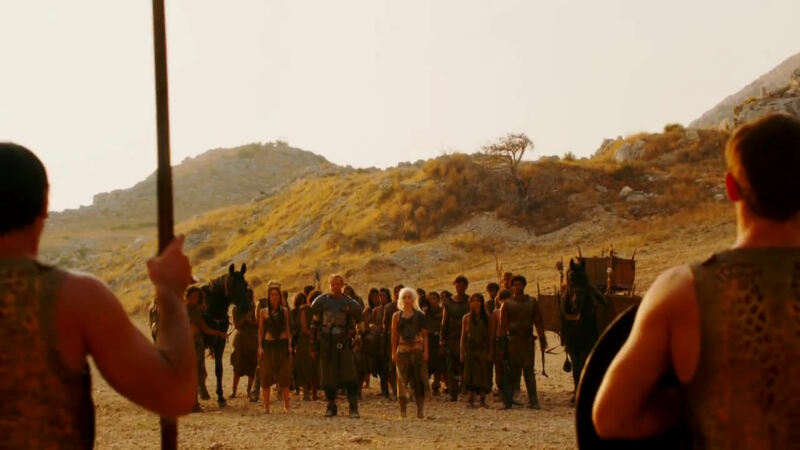 Great shot here, as we can see most of the Dothraki cast between two Qartheen guards: Daenerys and Ser Jorah, Doreah, and on the other side, holding the reins of the horse, Kovarro, a Dothraki warrior introduced this season. I’m not sure if that’s Irri next to him, and at least in this shot I’m not spotting Elyas Gabel as Rakharo. Two horses left to the Dothraki, one notes. The one on the right, with the strange contrapation? Those are wicker cages for the three dragons. As to the Qartheen guards, here we can see quite clearly that their armor is rather impractical (but quite showy): a latticework, similar to the belts we’ve seen on Qartheen men and women, I believe.